We would all like to have great looking skin that has healthy tone and appearance. However, many of us have an uneven skin tone with blemishes, dark spots, and darkened patches of skin. The reason for this poor complexion with an uneven skin tone is usually hyperpigmentation. When pigments in the skin called melanin start overproducing, small to large patches of the skin turn a darker color. There are a number of reasons why your skin tone can appear uneven because of hyperpigmentation. For example, too much exposure to the harmful sun’s UV rays, hormonal changes, acne, and aging, can all cause dark blemishes, freckles, and age spots. The hyperpigmentation can cause an uneven skin tone on any part of your body, including your face, hands, neck, legs, and arms. There are many great home remedies that can help even out your skin tone and return a youthful appearance to your skin. Natural ingredients like lemon juice, turmeric, milk, and black tea have proven results in helping to lighten skin. Other home remedies for uneven skin tone include ingredients to remove free radicals from the skin to improve its appearance. In this article, we will look at the causes of uneven skin tone and what you can do to treat and prevent hyperpigmentation. You will also find out how to use many effective home remedies to help gradually reduce the look of uneven skin tone. Melanocytes produce pigments called melanin which help to give skin, hair, and eyes their color. The most common reason for an increase in melanin production is overexposure to the sun. According to Dr. Kevin Berman on MedlinePlus, exposure to the sun’s rays causes more melanin to be produced. This causes pigmentation which darkens the skin and helps to protect it. However, too much sun exposure can cause sunburn and damage the skin. Dr. Shinjita Das from the Department of Dermatology at Harvard Medical School says that injury to the skin, acne, lupus, hormonal changes, thyroid disorders and some medications can all cause too much pigmentation in the skin. The most common symptoms of an uneven skin tone caused by hyperpigmentation are dark patches on the skin. This harmless condition can appear as a small cluster of freckles or larger coffee-colored patches of skin that give your skin a blotchy appearance. The American Osteopathic College of Dermatology (AOCD) says that hyperpigmentation can affect people of any age or race. Sun damage can cause age or “liver” spots to appear on the face or hands. Hormonal changes can result in larger patches of darkened skin on the face or abdomen. Very often, exposure to the sun will result in any age spots, dark skin patches, or freckles becoming more pronounced and darker. A condition called hypopigmentation can also cause uneven skin tone. This is where there are too few pigments in the skin and white spots and patches develop. Because dark patches of skin caused by hyperpigmentation develop over time, it requires time and patience to use home remedies to even out skin tone. However, natural ingredients can gradually reverse the symptoms of uneven skin tone and help you get beautiful skin and a more even complexion. It’s essential to wear a sunscreen every day to prevent black skin spots which give you an uneven skin tone. Sunscreen will help to make sure that any age spots or darkened patches of skin don’t become even more pronounced. The Journal of Clinical and Aesthetic Dermatology says that wearing sunscreen is a must while treating hyperpigmentation. You should choose a broad-spectrum sunscreen with a high SPF. The researchers also recommend reducing exposure to the sun’s rays by covering exposed areas of skin. So, on sunny days, wear long-sleeved tops, wide-brimmed hats, and long pants or skirts. Doctors from the AOCD warn that even just one day being exposed to too much sun can undo months of treatment for uneven skin tone. Studies into the potential of turmeric to treat uneven skin tone found that it is an effective skin lightening agent. Research has shown that curcumin has compounds that inhibit the production of melanin in the skin. Mix 1 teaspoon each of turmeric, raw organic honey, and natural yogurt in a bowl. Make into a thick paste (you may need to adjust the proportions to make a paste that sticks to your skin). Wash and cleanse your face and put on an old t-shirt or an old towel around your neck to prevent turmeric staining your clothes. Apply the turmeric evenly to your face and leave for 20 minutes. Repeat every few days to help even the tone of your skin and reduce the appearance of dark spots. You can also apply turmeric paste to get rid of dark patches of skin on your hands, arms, neck, or legs. Just remember that turmeric stains clothes and fabrics easily so make sure that the paste doesn’t drip anywhere. Lemon juice works well to help reduce the appearance of uneven skin tone and lighten skin. Lemon contains citric acid that can help to fade dark patches of skin and it also contains vitamin C which is good for your skin. When researching natural ingredients that can be used as skin whitening agents, the International Journal of Molecular Sciences reported on the use of lemon juice. The researchers noted that lemon extracts are used in some skin lightening applications. Also, dermatologist Dr. Susan Evans on WebMD says that the acidic content of lemon juice can help to lighten skin. However, you will need patience to see results when using lemon juice to even the tone of your skin. Since lemon juice can dry the skin (it is one of the home remedies to treat oily skin), you may need to follow it with a moisturizer. Apply to the dark blotches on your skin and leave for 10 to 15 minutes. Rinse off with warm water and follow with a moisturizer. Repeat 2 times a day and continue applying until you see the dark spots starting to fade. Mix 1 teaspoon each of lemon juice, raw natural yogurt, and honey to make a face mask. Apply evenly to your face and leave for 20 minutes to help improve your facial skin tone. Rinse with warm water and repeat daily until you see improvement. You can also use lemons to improve your skin from the inside by drinking lemon water every day to help flush toxins out of your body and get great looking skin. Raw unprocessed apple cider vinegar (ACV) contains a high amount of acetic acid that can help to bleach dark spots of skin. 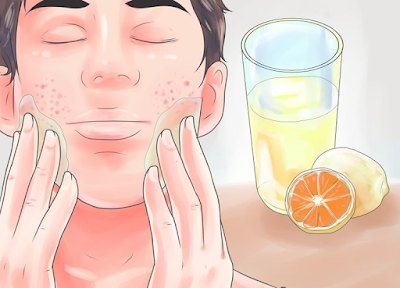 Actually, washing you face with apple cider vinegar is one way to help improve the general tone of the skin on your face and reduce age spots, acne, and pimples. Apart from being a natural antiseptic agent that can help to kill off skin infections, the acetic acid content of ACV can help with hyperpigmentation issues. A study from 2009 on treating skin pigmentation conditions found that acetic acid helps to improve skin texture. It was also reported that acetic acid helps to reduce melanin production and treat hyperpigmentation. Dilute raw apple cider vinegar with equal amounts of water. Apply to the area with the uneven skin with a cotton ball and leave for up to 5 minutes for the first time to let your skin get used to it. If you have not developed adverse skin reaction, you can leave the apple cider vinegar solution for longer to help lighten your skin and build up your skin’s tolerance. Aloe vera is a great home remedy to help balance uneven skin tone. Aloe vera has so many great uses for your skin including helping to relieve the effects of sunburn, soothing rashes and irritation, and reducing the appearance of scars. You can also apply aloe vera on dark spots of skin that have been caused by hyperpigmentation. Put some aloe vera on the tips of your finger and gently massage into the dark patches where you have uneven skin tone. Use the aloe vera daily as part of your natural skincare routine to help improve uneven skin tone and lighten age spots naturally. You can use mulberry extract as a natural skin lightening agent and improve the look of uneven skin tone. Mulberry contains compounds that inhibit melanin production and can help get rid of darkened patches of skin. The Biological & Pharmaceutical Bulletin reported that mulberry extract has skin lightening properties. Studies have shown that extracts from mulberry can inhibit a compound that is involved in melanin production. The study concluded that mulberry leaf extract has potential as a skin whitening agent. The easiest way to use mulberry to lighten dark skin patches naturally is to look online for natural skin products containing mulberry extract. Natural products containing soy milk can help treat an uneven skin color and reduce the signs of hyperpigmentation. The Journal of Drugs in Dermatology reported that soybeans contain compounds that inhibit melanin production in the skin. One trial found that using a soy moisturizer helped to improve the signs of pigmentation, blotchiness, and skin tone in a 12-week period. You can use milk and yogurt products to improve your skin tone and reduce the appearance of dark skin spots. Milk contains lactic acid which has many skin benefits and can give your skin a more youthful appearance. A study from Taiwan found that products containing lactic acid have a skin lightening effect. As well as helping to affect the production of melanin, lactic acid also has an antibacterial effect on acne-causing bacteria. Other studies have shown that lactic acid and glycolic acid from milk help reduce the signs of hyperpigmentation. Mix 1 teaspoon of milk powder with some milk to make a smooth thick paste. Apply the milk skin-lightening mask to your face and neck and leave for 20 minutes. Use the milk powder facial remedy 4 times a week to improve the signs of uneven skin tone. Yogurt has already been mentioned previously in one mask in the article. However, you can use plain natural yogurt on its own to whiten dark spots and reduce the appearance of uneven skin tone. Mix one tablespoon plain yogurt with a little water. Spread the yogurt remedy over your face and let it dry (it will take about 20-30 minutes). Apply the mask regularly to improve the tone of your blotchy skin. You can use black tea to reduce the appearance of uneven skin tone caused by hyperpigmentation. Black tea is a natural astringent that cleanses your skin and keeps it looking healthy. The astringent properties of black tea are due to tannins which also have antioxidant properties. Clinical trials into black tea have found that it has a whitening effect on the skin. Researchers found that black tea water inhibited the production of melanin and had a visible whitening effect on skin.12 Although the trial was carried out on guinea pigs, it is known that guinea pigs have skin similar to humans and produce similar skin reactions. Dip a black tea bag into hot water and let it steep for a few minutes. Take the tea bag out and allow it to cool. Place the tea bag directly on the affected patches of skin and leave for a few minutes. Leave the tea to dry on your skin. Repeat the process twice a day to help reduce the appearance of uneven skin tone. Products containing extracts of vitamin C have helped many people to lighten darkened patches of skin and even out skin tone. A study into the benefits of vitamin C on the skin found that it can help to improve the appearance of skin tone by ridding the skin of free radicals. However, it is not always possible to find stable compounds of vitamin C that have the best dosage for the skin. The study pointed out that the best kind of skin products for treating hyperpigmented, uneven skin should contain both vitamin C and vitamin E.
The research also mentions the current limitation of many skin products containing vitamin C by saying that because vitamin C is unstable and difficult to deliver into the dermis in the optimum dosage, research is being conducted to find stable compounds of vitamin C and newer methods of delivery of vitamin C into the dermis. Rosehips contain compounds that can help to inhibit the production of dark skin pigments and whiten skin. Various studies suggest that taking rosehip orally as well as topically can also help in treating hyperpigmentation issues. For example, a study from 2011 found that rosehip extracts can help reduce pigmentation on the skin. Rosehip helps to inhibit the chemical that stimulates the production of melanin. The researchers concluded that taking rosehip extract orally can be a useful skin-whitening agent. Skin creams containing licorice can assist in lightening the skin and reducing the appearance of hyperpigmentation. Licorice cream is also effective as a natural home remedy to treat many inflammatory skin conditions like eczema and psoriasis. The Journal of Investigative Dermatology Symposium Proceedings reported that licorice extracts have anti-pigmentation properties and can help inhibit melanin. Studies have shown that a cream with 20% licorice extract can help to reduce the appearance of dark spots within 4 weeks.